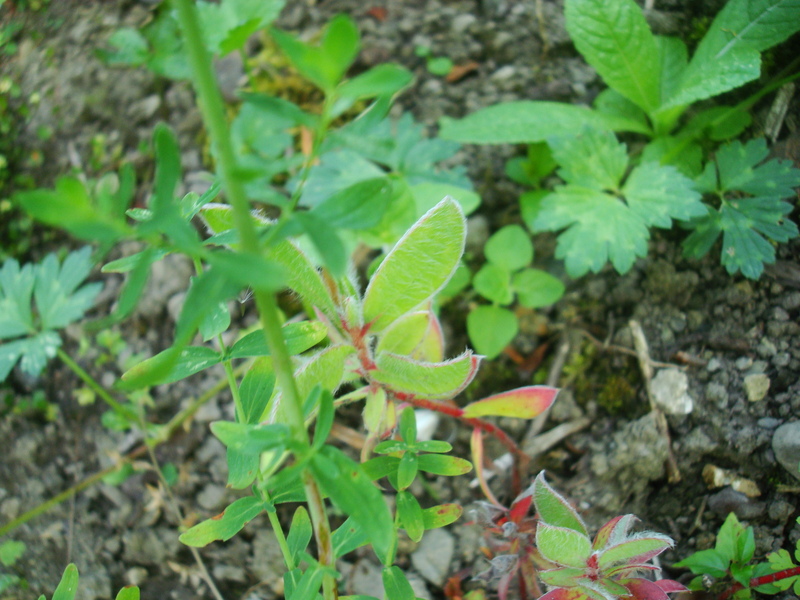 Kind of Looking Back – Lass leben! 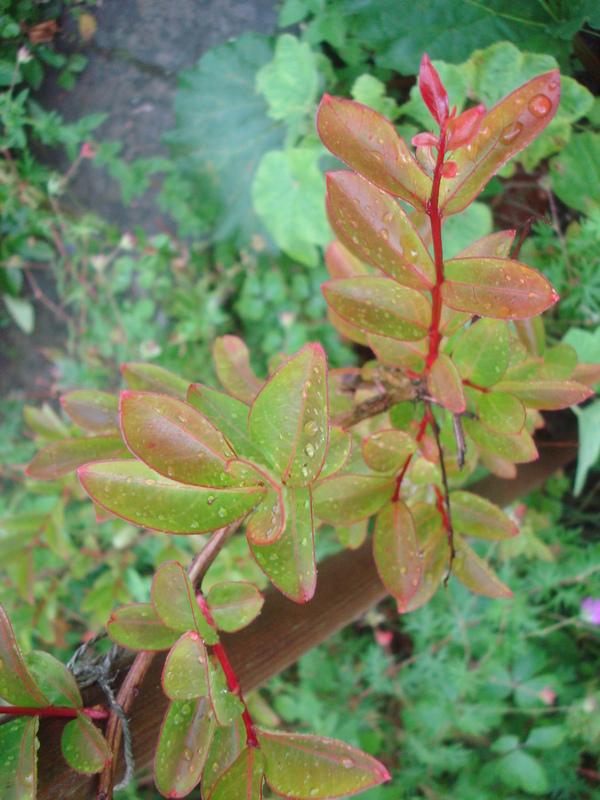 I tested these two species of Aristotelia: A. chilensis in the front, and A. serrata in the back with red stems. This Aristotelia serrata got nearly killed last winter. 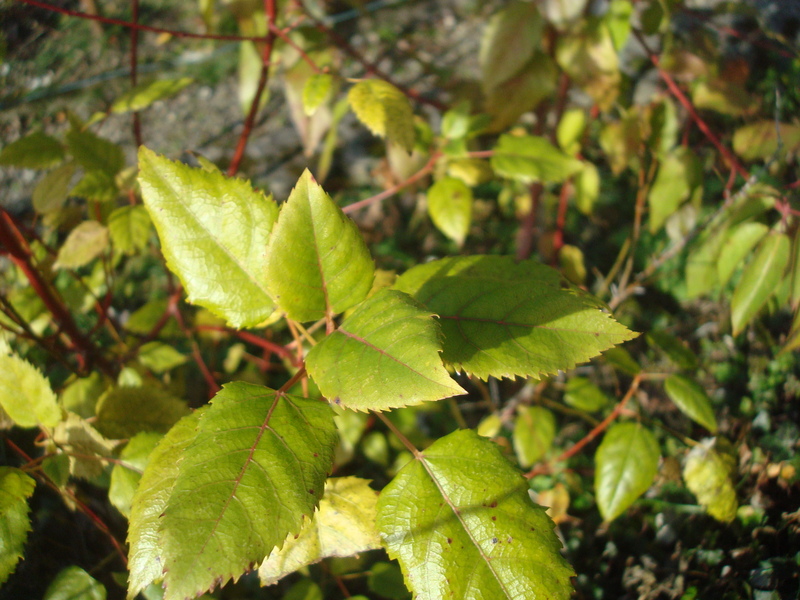 Azara petiolaris was hit bad by the long winter cold last year. Not as hardy as I thought. A Banksia seedling that’s still living. I forgot which species it belongs to. 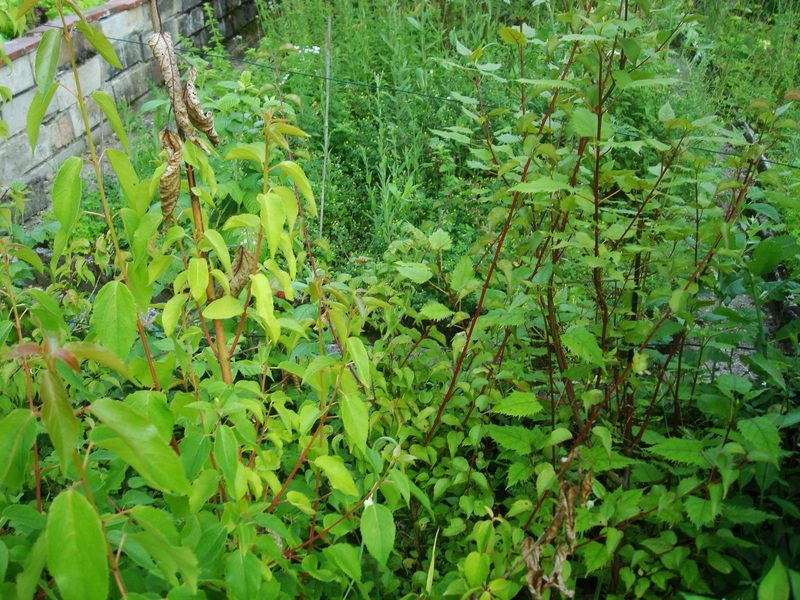 On the left some Dianella tasmanica and creeping on the right: Muehlenbeckia axillaris. 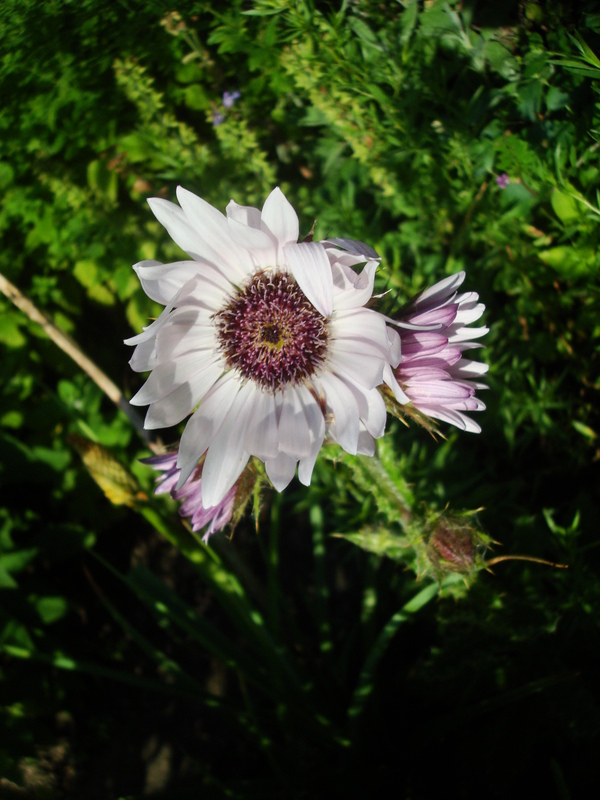 Berkheya purpurea from South Africa has beautiful flowers and is hardy (though not long-lived). But I think it needs better drained soil for long-term success. The color is awesome. 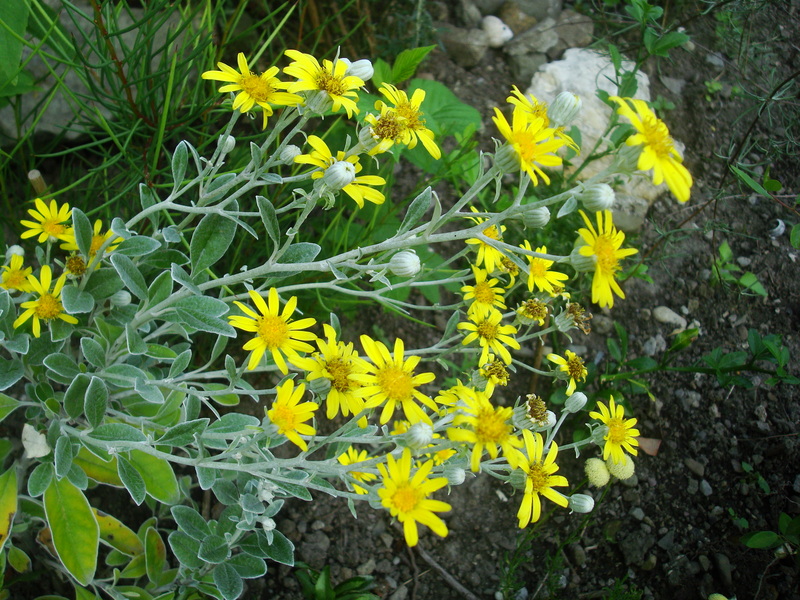 Flowering Brachyglottis greyi ‚Sunshine‘. I love my combination with Hakea microcarpa (the photo doesn’t show it quite right). 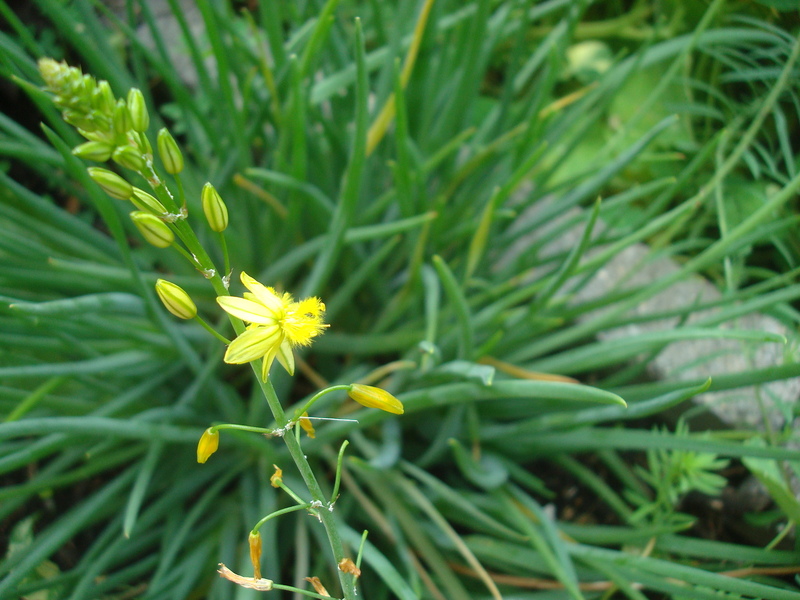 Bulbine bulbosa is definitely not hardy. 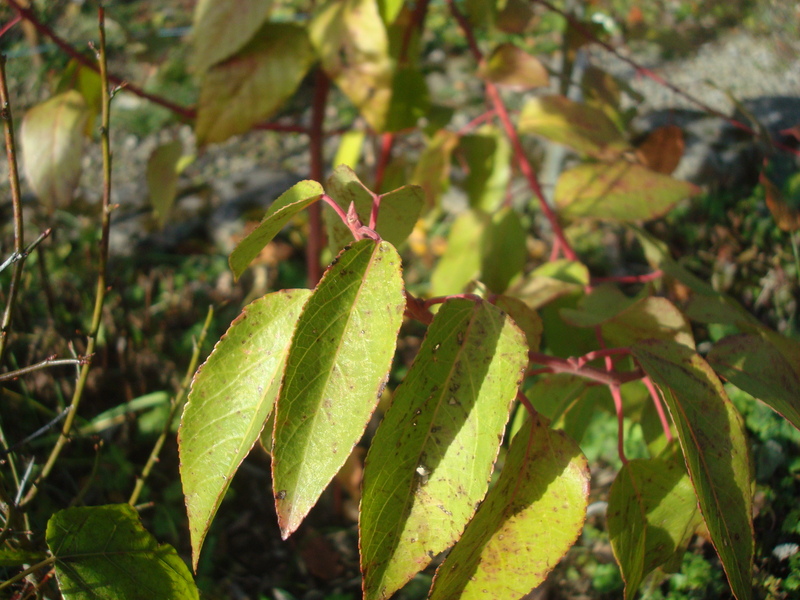 A Zone 9 plant, can’t survive temps under -5°C. 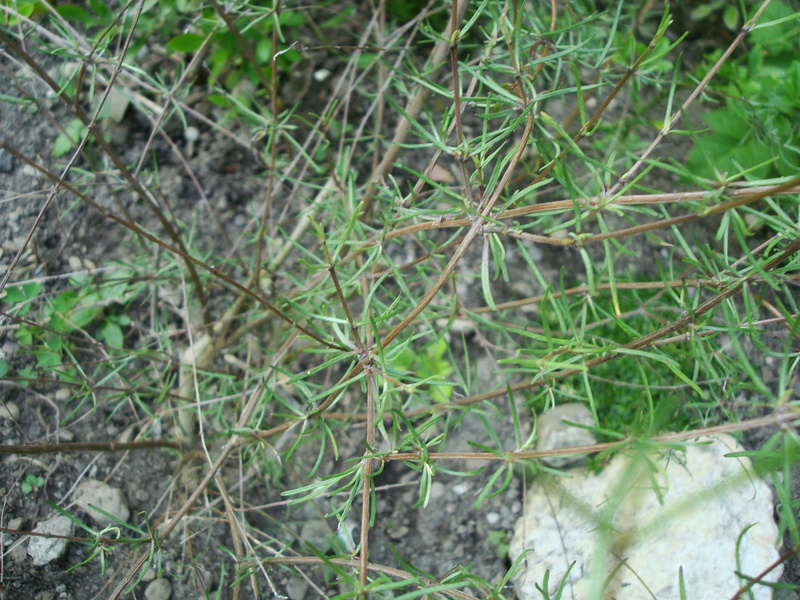 Chiliotrichum diffusum ‚Siska‘ looks like Lavandula. 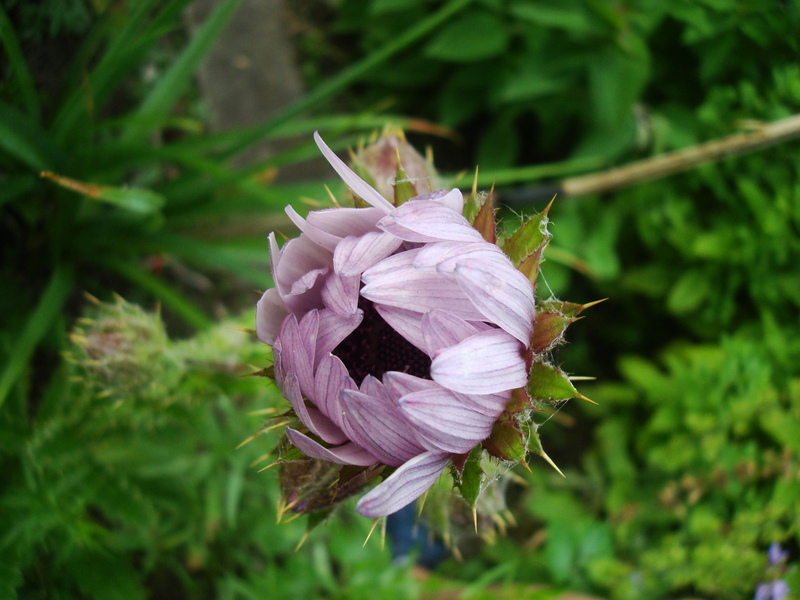 Chrysanthemum indicum ‚Nanking‘ just died last winter. I wasn’t expecting that. 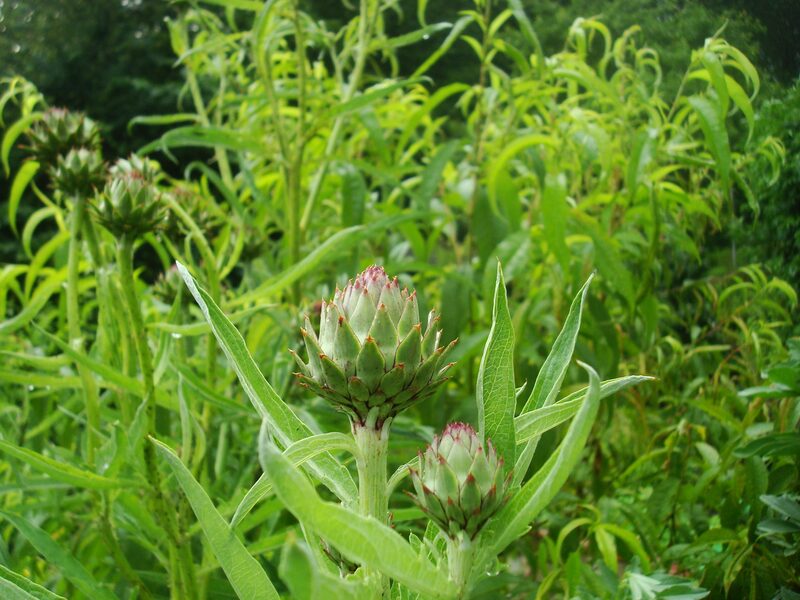 It flowered extremely late in the year, just before the hard frosts; the plant was too big and not that great to eat. 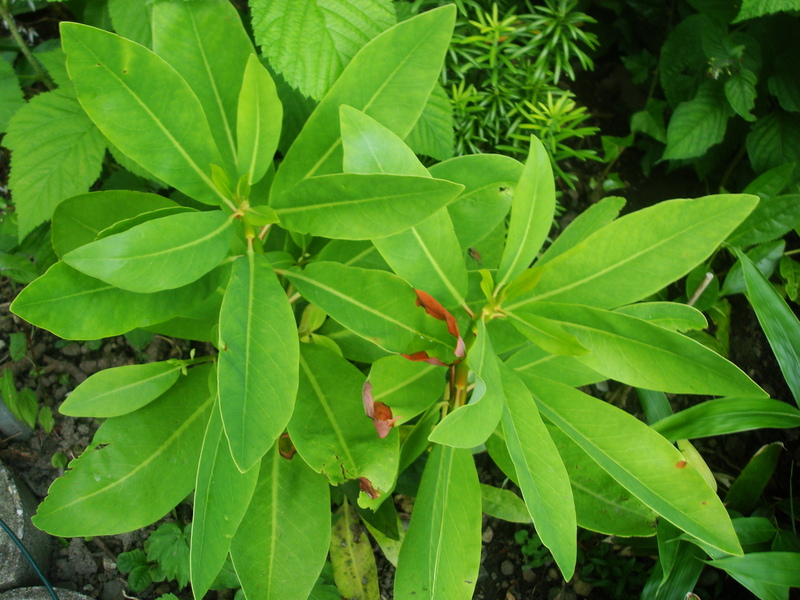 Commelina tuberosa, which supposedly has edible tubers, didnt come back after last winter. 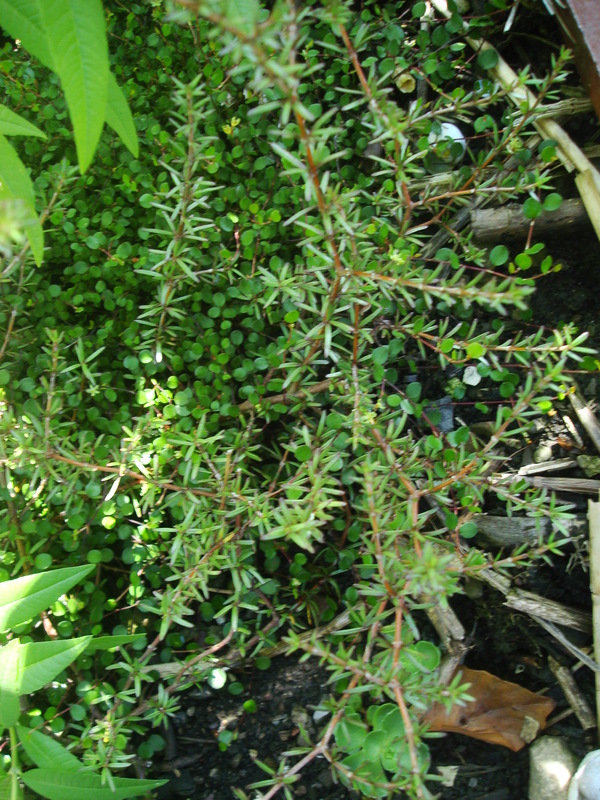 Another of my own favorite plant combinations: The ground-covering Muehlenbeckia axillaris with the small Coprosma acerosa var. 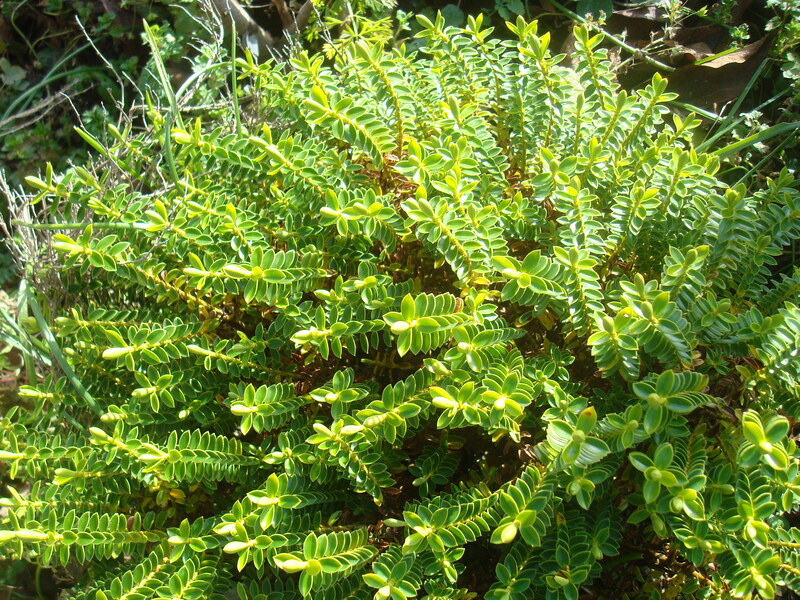 brunnea ‚Bruno‘. 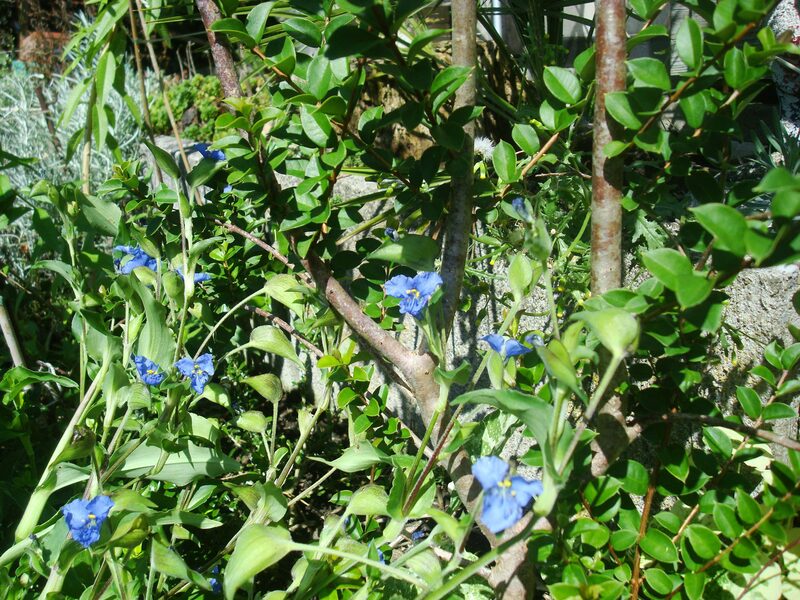 Now, this year I bought some female plants, so I’m hoping for its spectacular blue fruits. 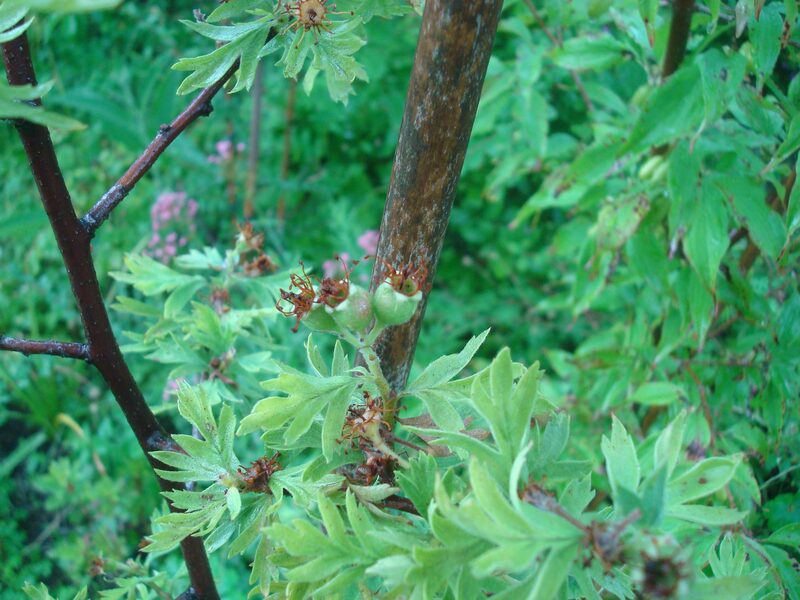 Crataegus orientalis with unripe fruit. The fruit tastes like apples, however, it has some big, hard seeds in it. 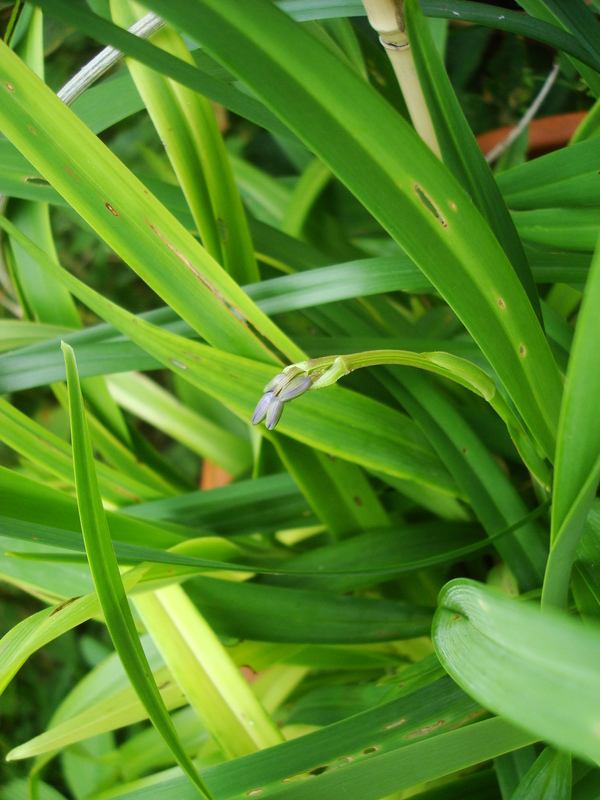 Dianella congesta flowered once, but didn’t set fruit. It’s not hardy (I tested it), I keep it in a pot. 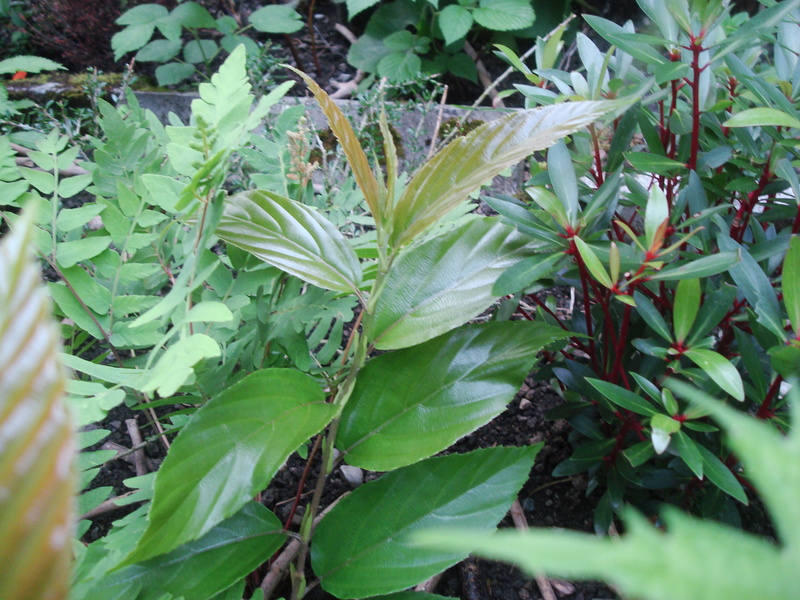 Big-leaved Drimys winteri with Cephalotaxus harringtonia ‚Fastigiata‘. Interestingly, the Cephalotaxus got hit hard by the late frost. Both plants are fine now. 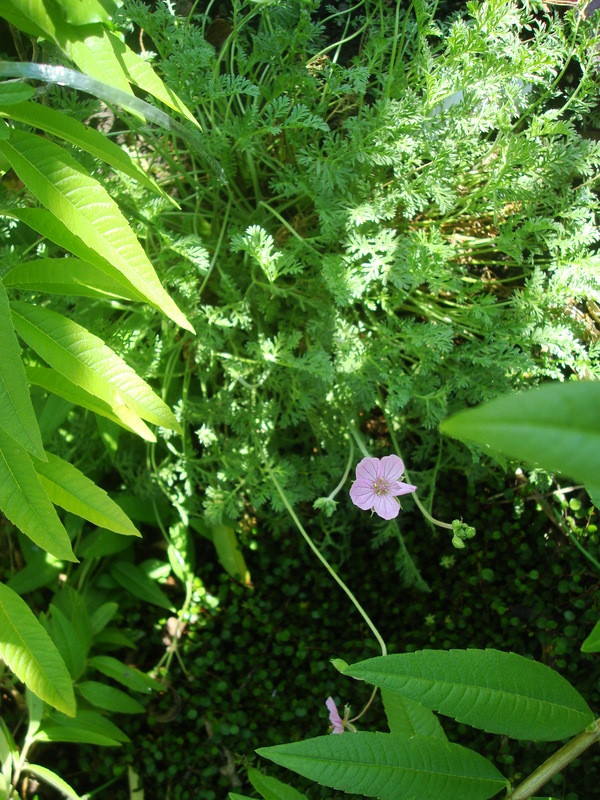 I bought this as Erodium petraeum, but it’s more likely a hybrid. 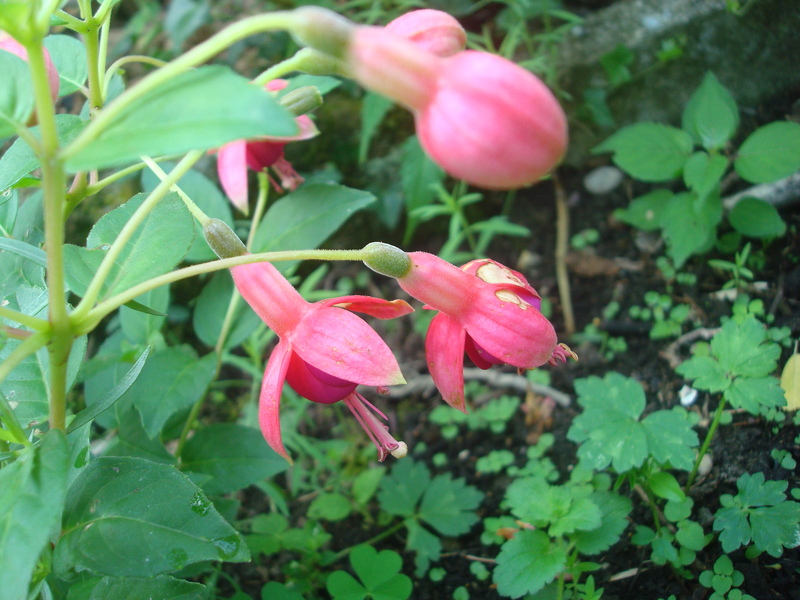 Fuchsia ‚Phyllis‘ freezes back each winter. 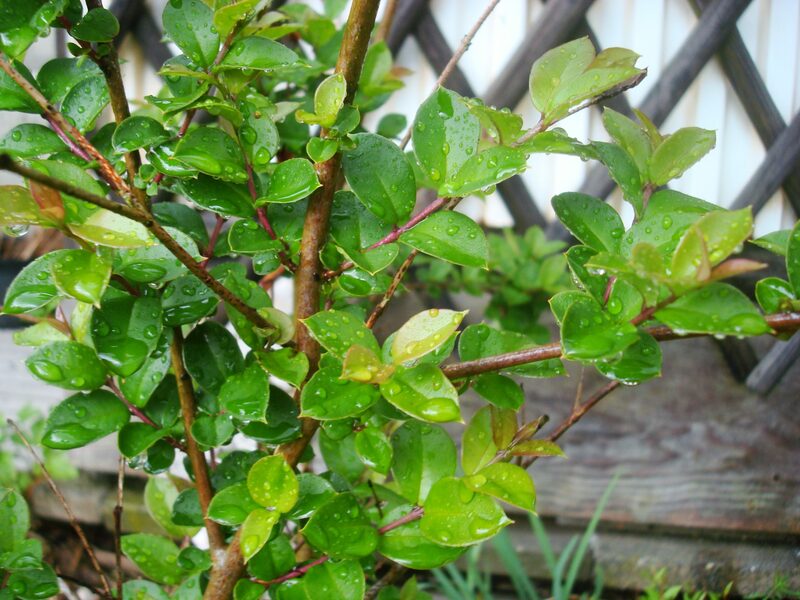 The beautiful Gevuina avellana died during summer, so I couldn’t even test it for winter hardiness. 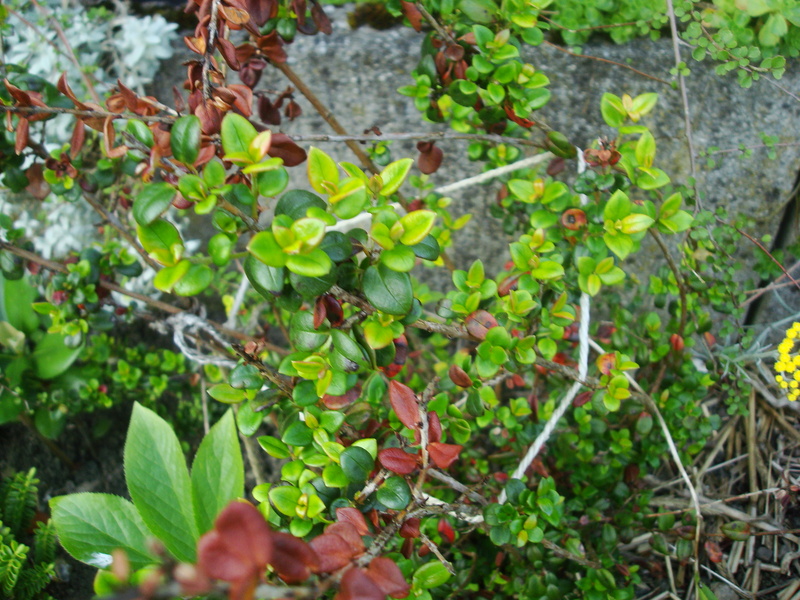 In the foreground some blooms of Ugni molinae. 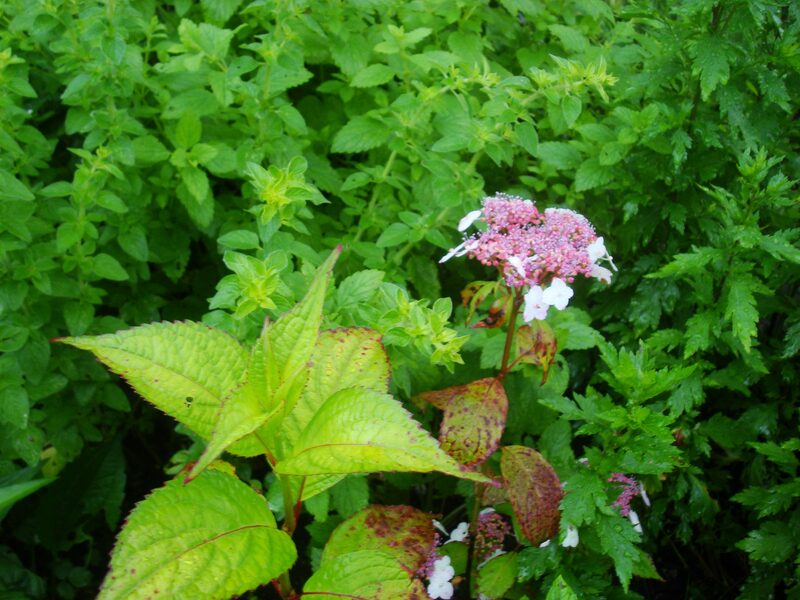 It’s possible to make tea with Hydrangea serrata ‚Oamacha‘. 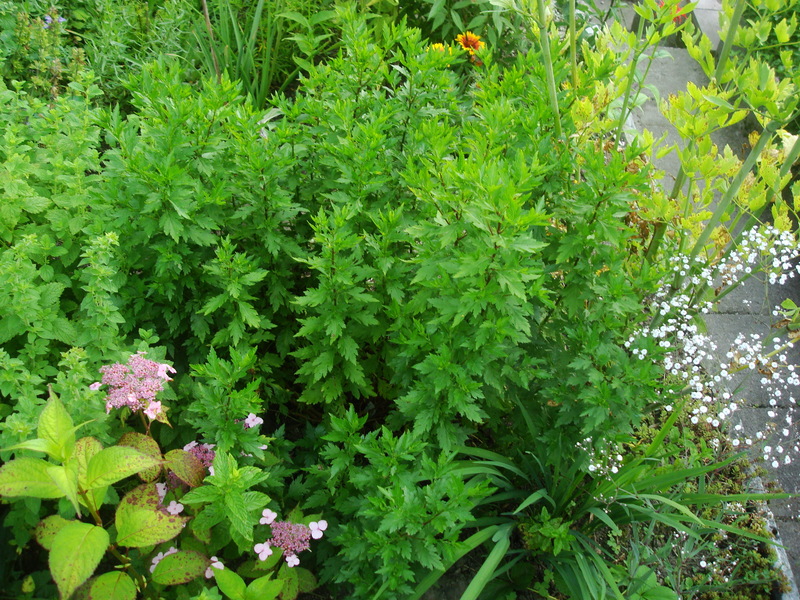 In the background some wild Oregano and Melissa. 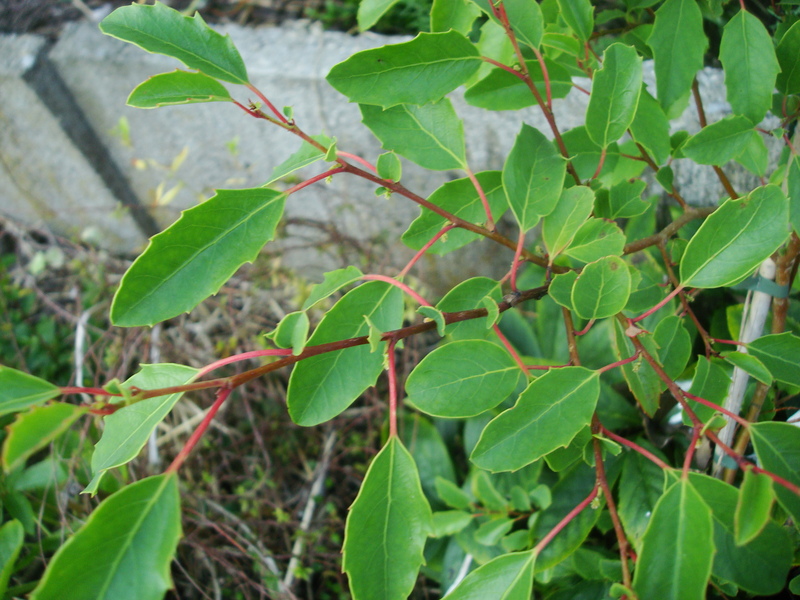 Ilex vomitoria is closely related to Yerba Mate and its leaves contain caffeine. 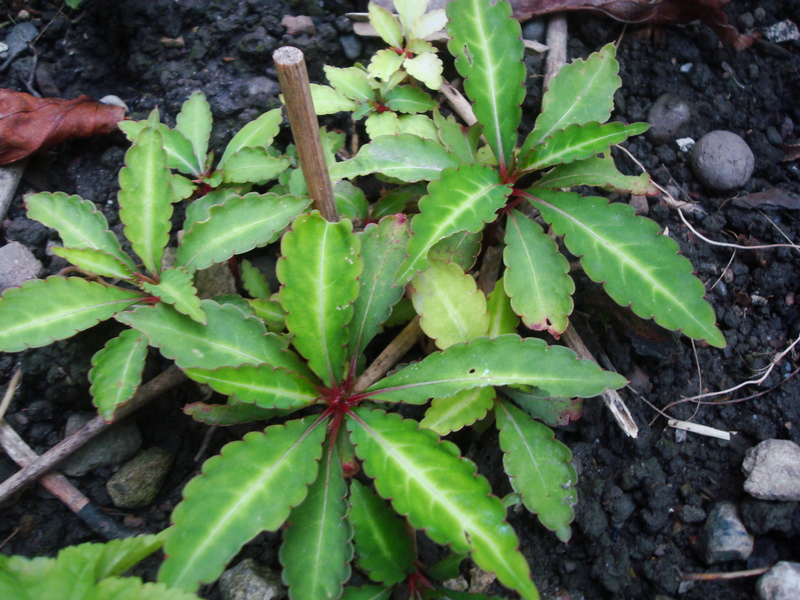 Impatiens omeiensis isn’t growing well for me. Lagerstroemia indica ‚Violet‘ flowered only once in my garden. 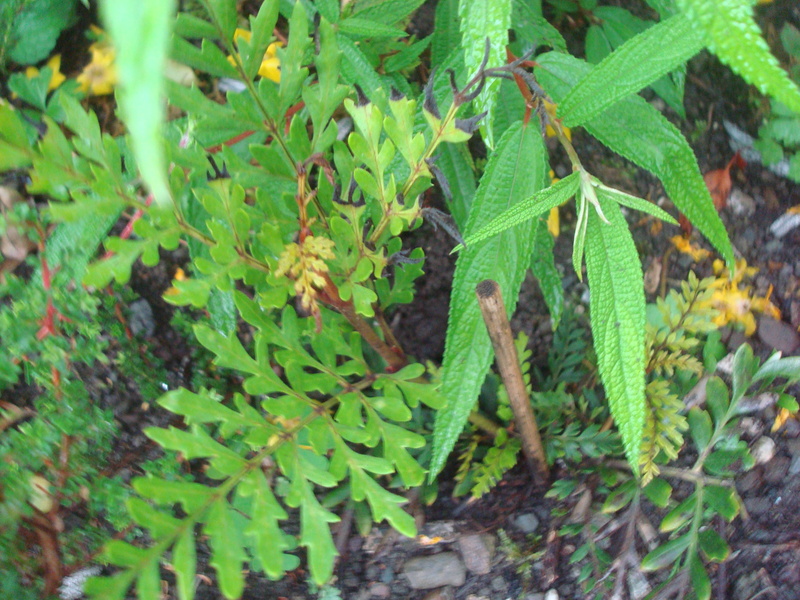 Lomatia ferruginea was already dying during the warmer season, but winter gave it the rest. 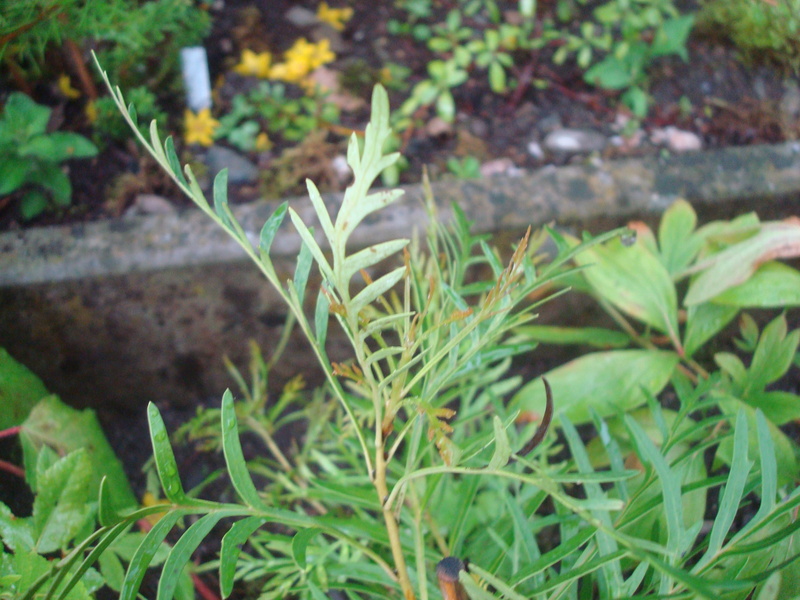 My other Lomatia, L. tinctoria, on the other hand, is doing fine. Luma apiculata got hit by our last winter and froze almost to the base. 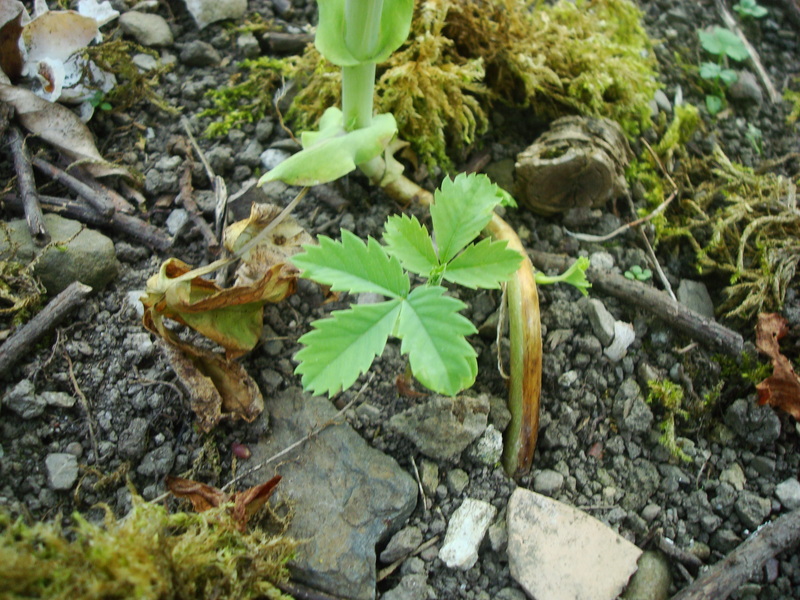 From several Melianthus major, that I grew from seed, only a little one survived last winter. 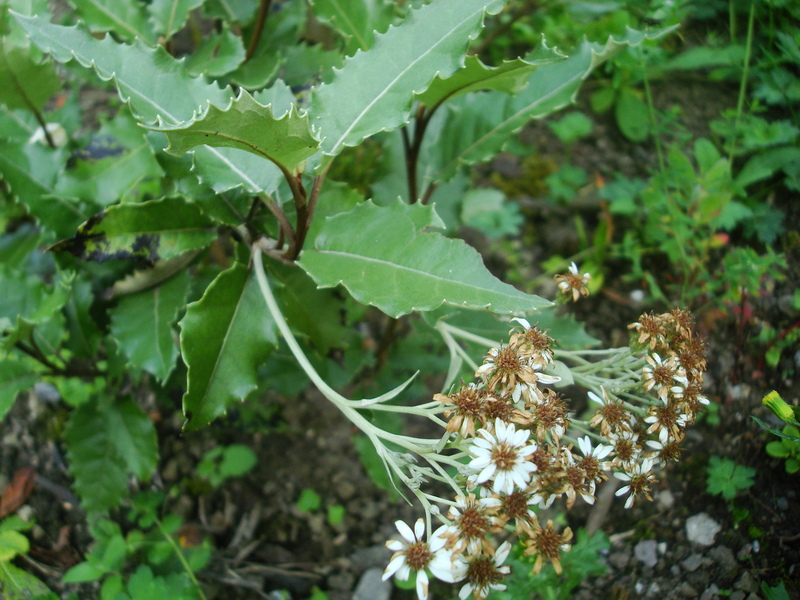 The beautiful Olearia macrodonta came barely through the winter and was killed by the late frost. A bummer! 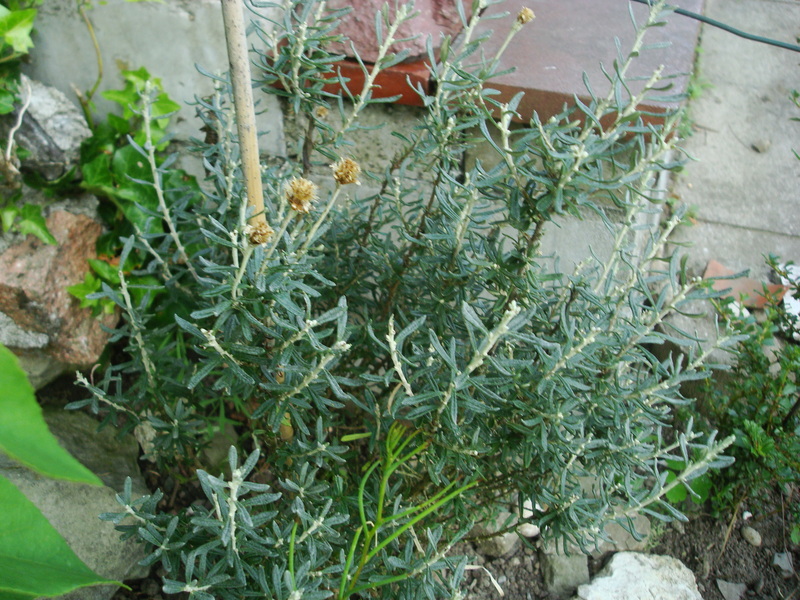 Olearia virgata lineata lost its leaves, but seems to have good winter hardiness. 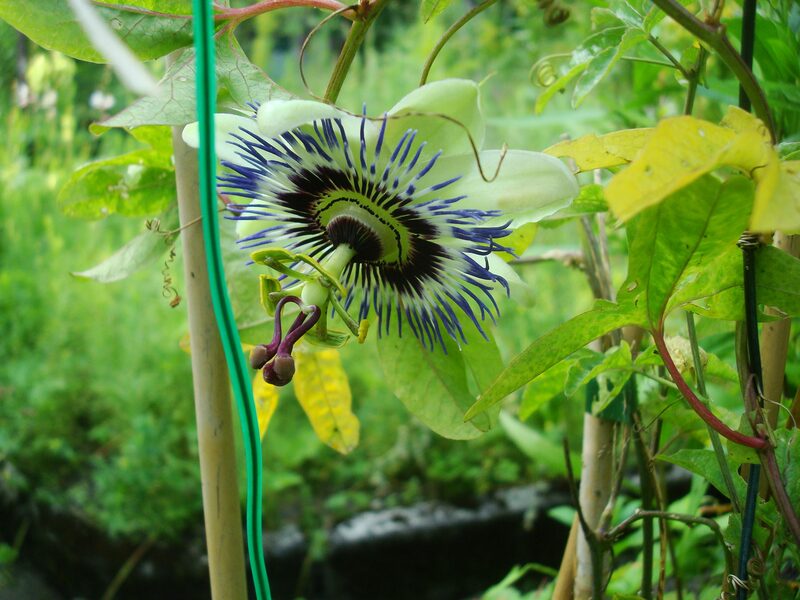 Passiflora caerulea barely made it through winter. 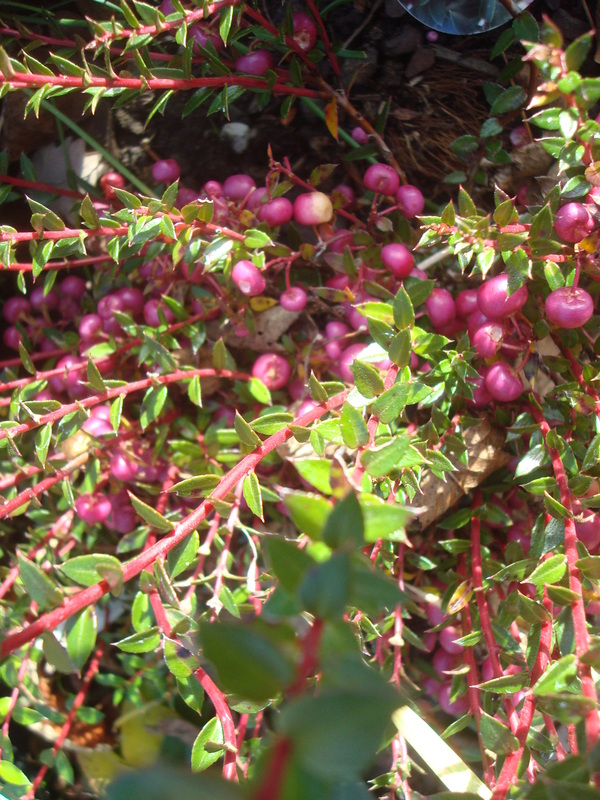 Pernettya/Gaultheria mucronata is easy and hardy. 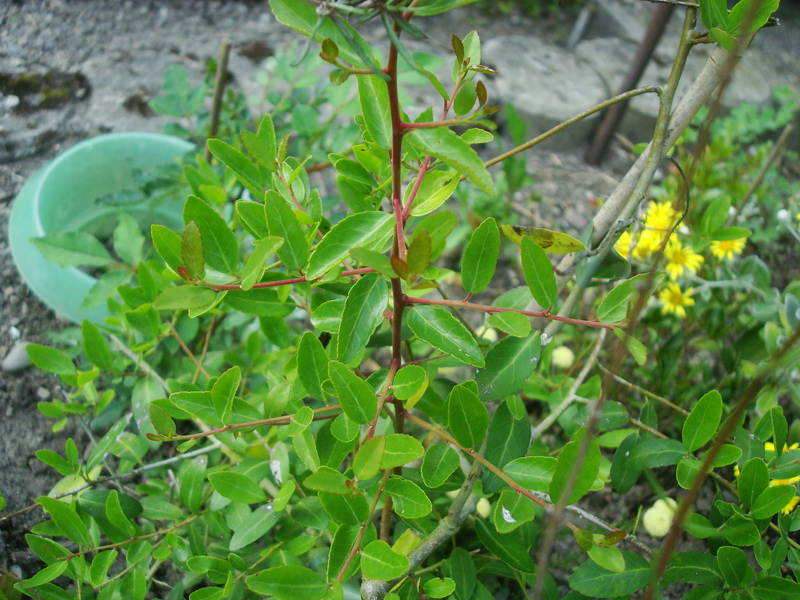 Polylepis australis has made it through its first winter just fine. 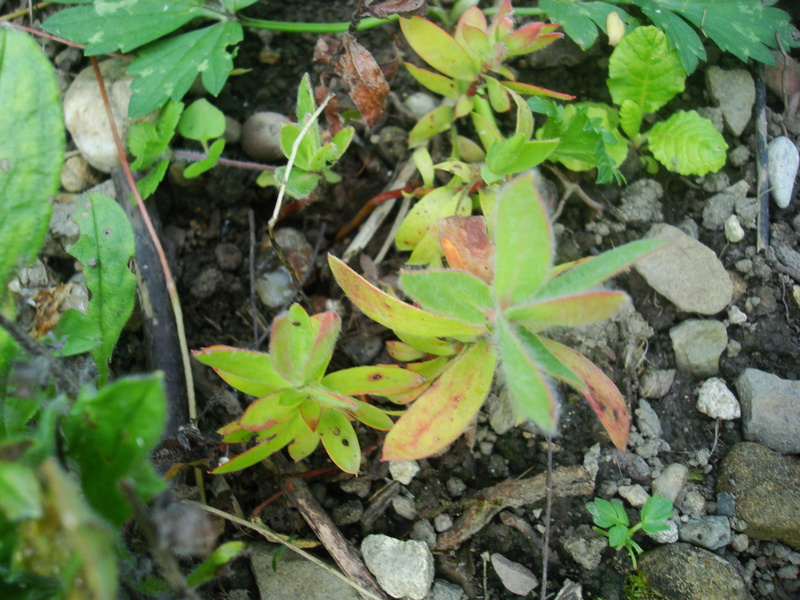 The Protea seedlings, I planted out (they’re supposedly high-altitude species), didn’t make it. 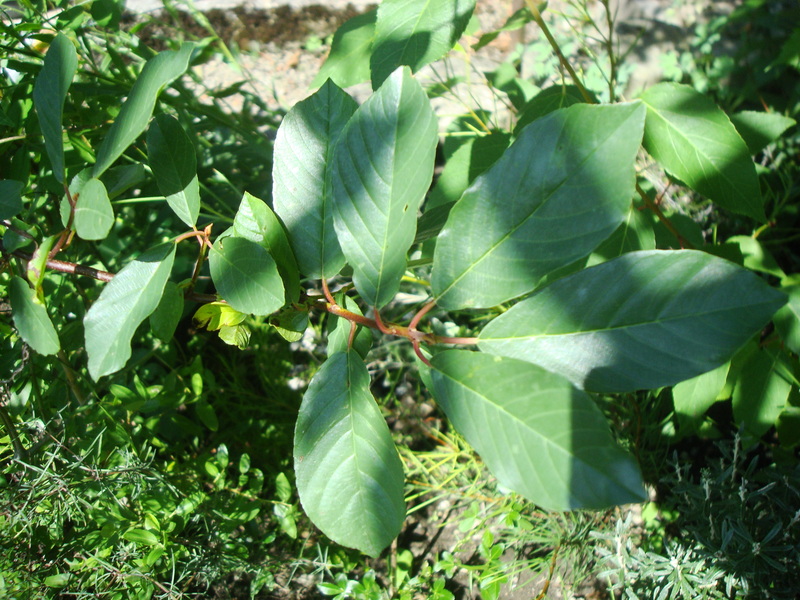 I bought this as Rhamnus californica. 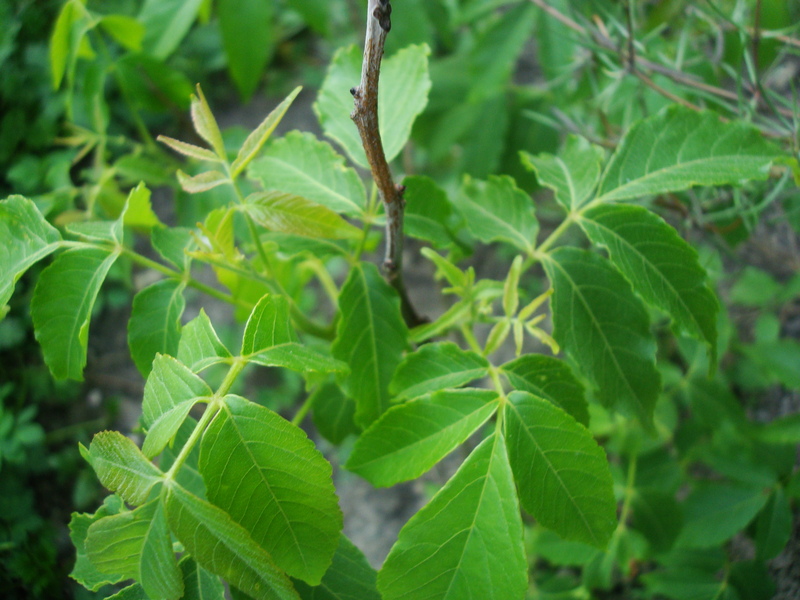 It’s semi-evergreen, but it just looks like a regular Frangula alnus. 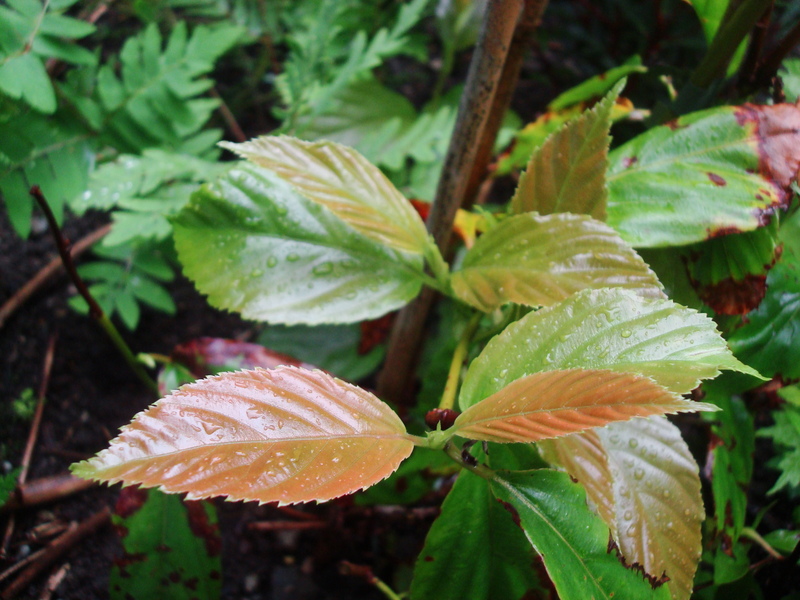 Rubus acuminatus with Tasmannia lanceolata ‚Red Spice‘ on the right. 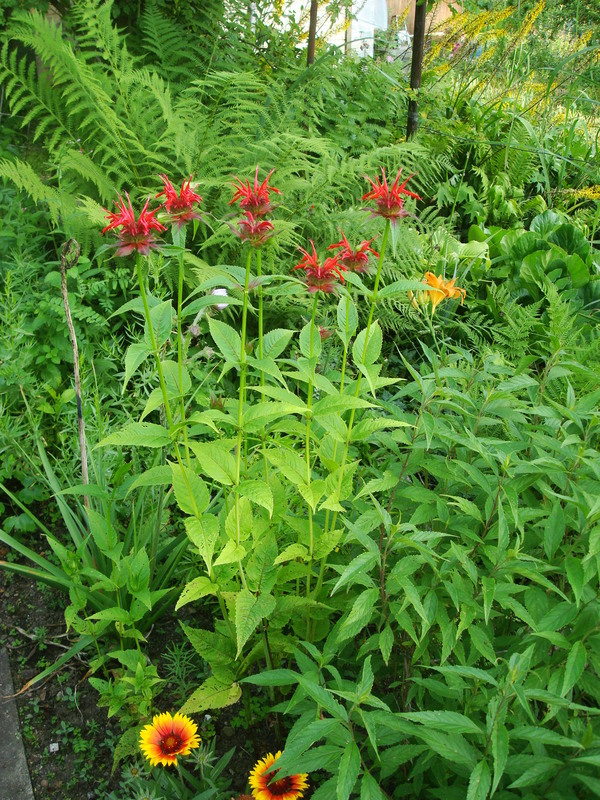 This nice Monarda perished last winter. 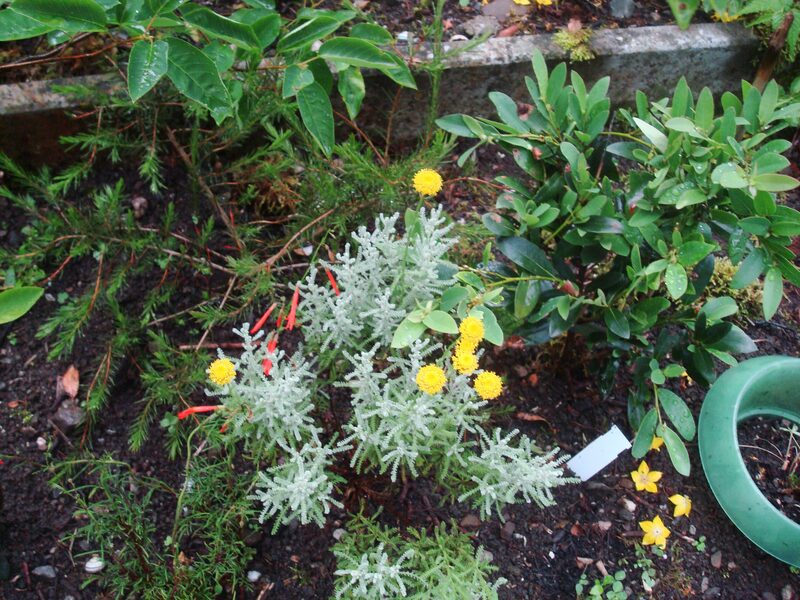 In the center, silver with yellow blooms: Santolina chamaecyparissus. 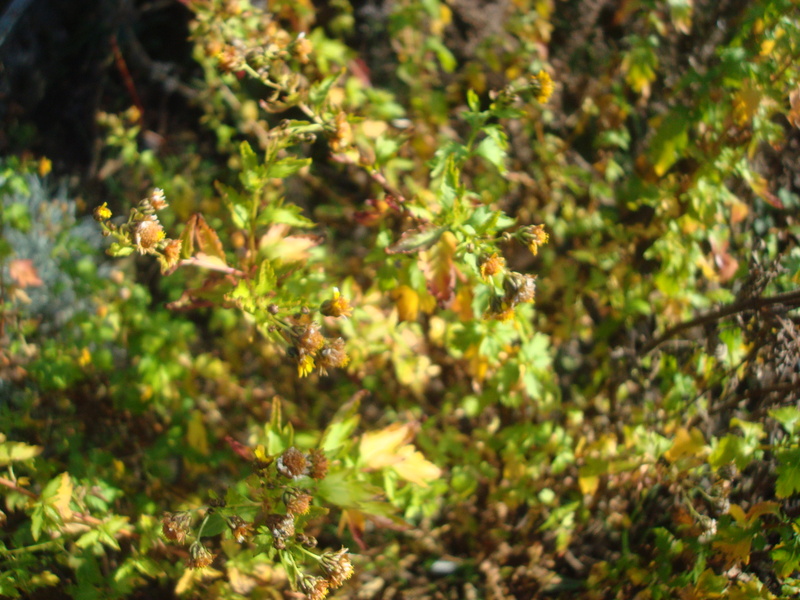 On the right: Distylium myricoides is a bit of a messy plant. 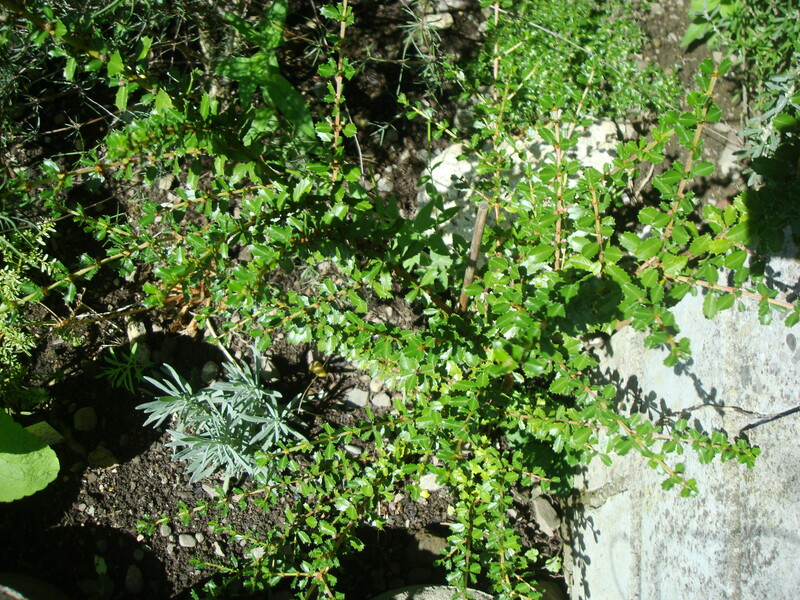 On the left in the back of Santolina: Callistemon sieberi ‚Widdicombe Gem‘. 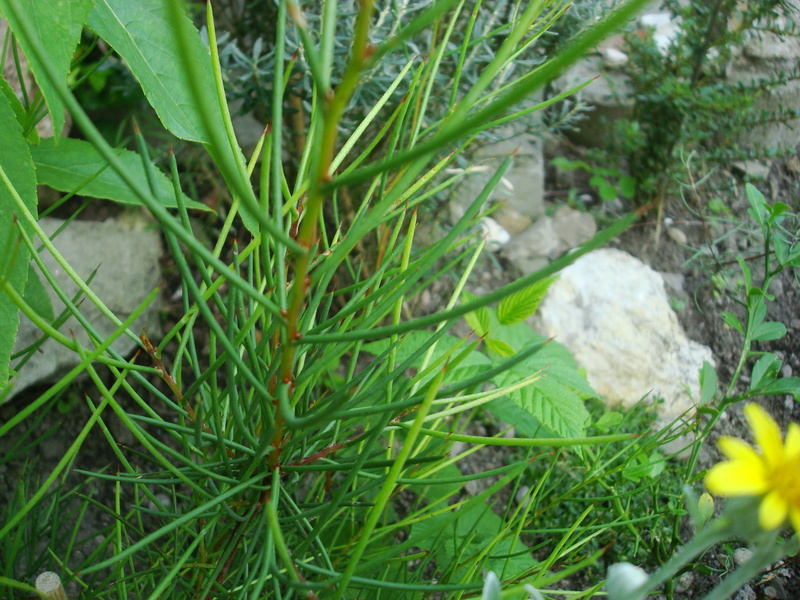 On the left, in front of the Callistemon with red flowers: Penstemon pinifolius. 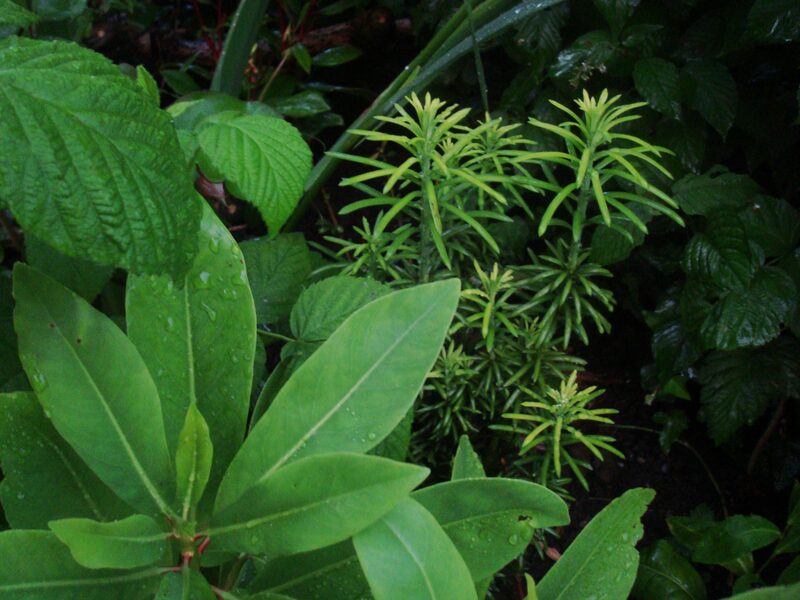 This plant composition doesn’t exist anymore, I shuffled some of the plants around and to other places. But they all are still living. 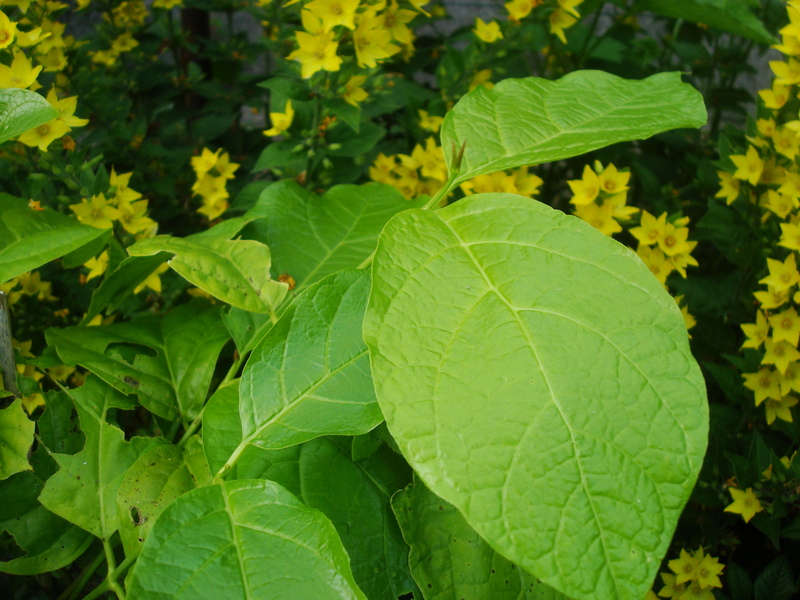 Sinocalycanthus chinensis flowered this year for the first time. I’m not a fan of this plant, the snails however are. 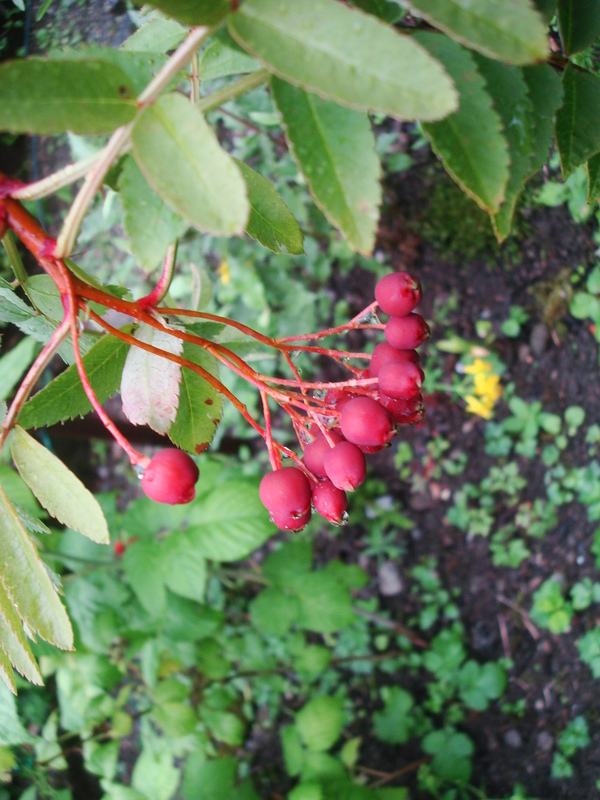 Ripe berries of Sorbus rosea. 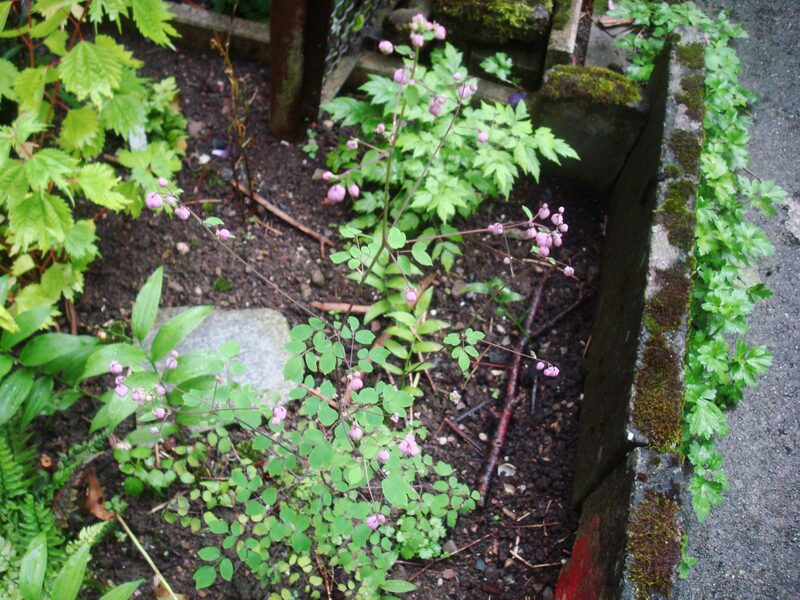 I liked Thalictrum delavayi ‚Splendide‘. It didn’t come back in spring. 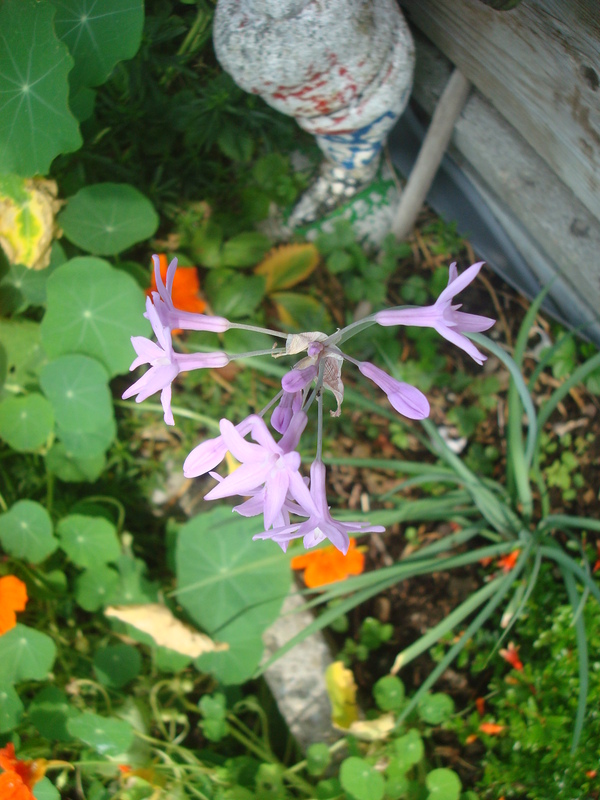 Tulbaghia violacea survived one winter, but not the second. 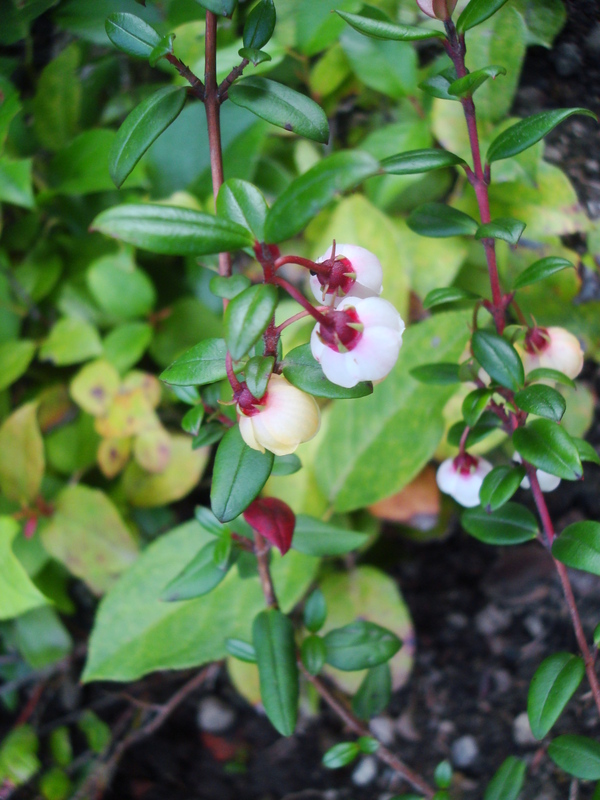 The delicate flowers of Ugni molinae. 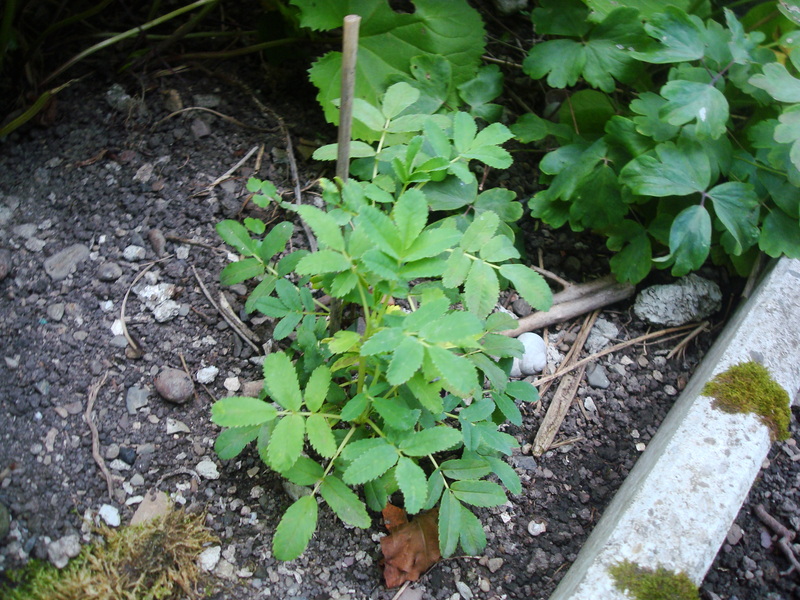 It’s not hardy enough and it doesn’t regenerate fast, I have to keep them in a pot. 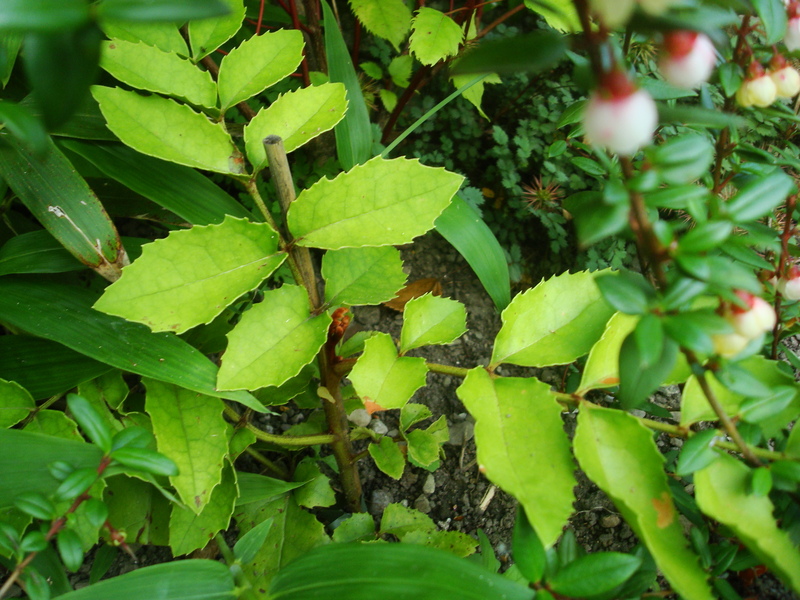 Ugni molinae is not hardy enough and it doesn’t regenerate fast, I have to keep them in a pot. 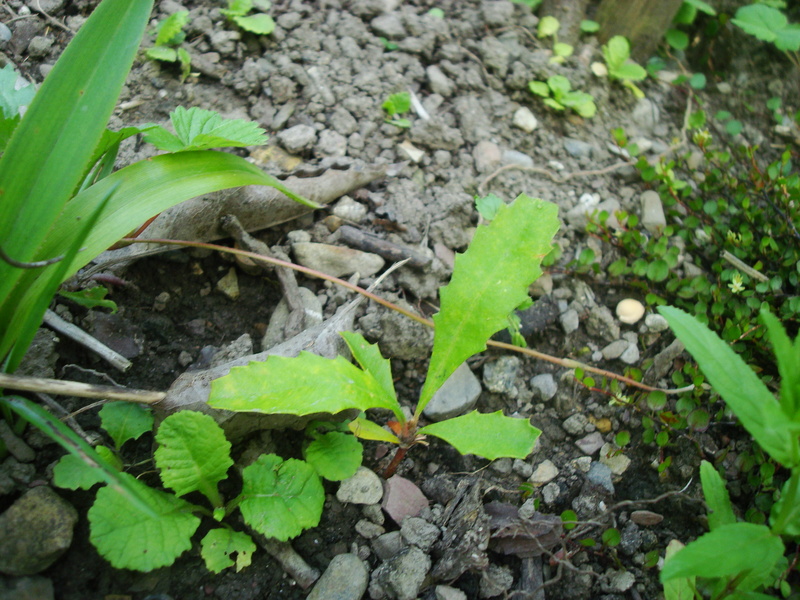 Ungnadia speciosa freezes mostly back to the ground. 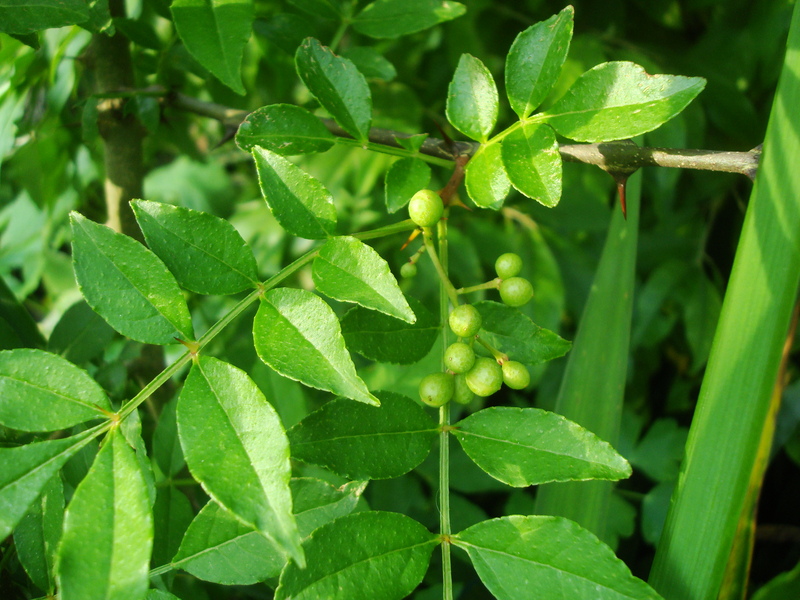 The berries of Zanthoxylum simulans have a great, overpowering aroma.